Being arrested for possession or distribution of MDMA in New Jersey means you are exposed to serious punishments that can impact your life for years to come. MDMA, also known as “Ecstasy” or “Molly,” is a type of synthetic drug that acts as a stimulant and hallucinogen. This psychoactive substance is used often as a recreational drug to cause euphoria, increased energy, empathy, and intense sensations. MDMA is an abbreviation for the chemical agent 3,4-Methylenedioxymethamphetamine. Molly, which stands for molecular, is classified as a Schedule I controlled dangerous substance in New Jersey. As such, it has been determined that Ecstasy has a high potential for abuse, is not currently accepted for medical treatment in the U.S., and is not suitable to use for medical treatment even under supervision. Because Molly has become increasingly popular in the last few years, law enforcement officials in New Jersey are issuing more and more criminal charges for possession and distribution of MDMA. If you are facing Ecstasy charges in South Jersey, you need to speak with a knowledgeable criminal defense lawyer as soon as possible. At our criminal defense law firm, our attorneys are dedicated to providing superior defense representation for clients charged with drug crimes in Burlington County, Gloucester County, Camden County, and surrounding communities. Attorney William Fay, a partner at our firm, uses years of experience as a former Deputy Attorney General for the New Jersey Attorney General’s Office to obtain the most favorable outcomes for our clients. His work investigating and prosecuting criminal cases makes him a vital asset and integral part of your best defense. He knows how officers and prosecutors investigate drug cases involving Molly and we use this to provide a significant edge against the prosecution. If you have been charged with possession or distribution of MDMA, contact our office now at 609-832-3202 for an absolutely free consultation. According to the New Jersey drug possession statute, N.J.S.A. 2C:35-10, possession and use of Ecstasy is a third degree crime. This is an indictable offense, also known as a felony, which will be prosecuted in the Superior Court in the county where the alleged offense took place. Simply possessing any amount of Molly in New Jersey can result in a prison sentence of up to 5 years, a fine of up to $35,000, and suspension of your driver’s license. Notably, if you are found in possession of MDMA on school property or property used for school purposes, you will be required to perform community service in addition to any other penalties imposed. On the other hand, if you are caught using Molly in New Jersey, this is typically considered a disorderly persons offense, which is handled in the local municipal court where the charges were issued. Being under the influence of Ecstasy exposes you to up to 6 months in the county jail and a fine of $1,000. You may also lose your driving privileges for up to 6 months. 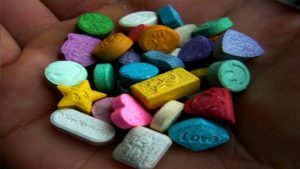 As with the vast majority of drug charges in New Jersey, charges for distribution of Ecstasy or intent to distribute Molly are graded based on the amount of CDS involved in the specific case. Being charged with an MDMA offense in violation of NJSA 2C:35-5 means you are facing significant prison time. If the offense involves less than 0.5 ounces of Molly, this is a third degree crime, punishable by a prison sentence ranging from 3 to 5 years and a fine of up to $75,000. For Ecstasy distribution involving between 05. ounces and five ounces, this is a second degree crime with prison exposure between 5 and 10 years and a potential fine of up to $150,000. Lastly, if you are accused of distributing or intent to distribute 5 ounces or more of MDMA, you are facing first degree criminal penalties. A first degree drug distribution charge is punishable by up to 20 years in NJ State Prison and a $500,000 fine. It is important to note that you may face additional charges if your Ecstasy distribution offense occurs within a school zone or within 500 feet of public property such as a park, housing facility, or government building. Whether you have been charged with possession of Ecstasy, using Molly, or intent to distribute MDMA in South Jersey, the criminal defense attorneys at our firm can help. We know the stakes and will fight tooth and nail in court to prove your innocence. For a free consultation about your Ecstasy charges, contact our office at 609-832-3202 or contact us online to schedule an appointment.